The library, founded in 1653, is the oldest surviving public library in Britain. It was established under the will of Humphrey Chetham, a prosperous Manchester textile merchant, banker and landowner. 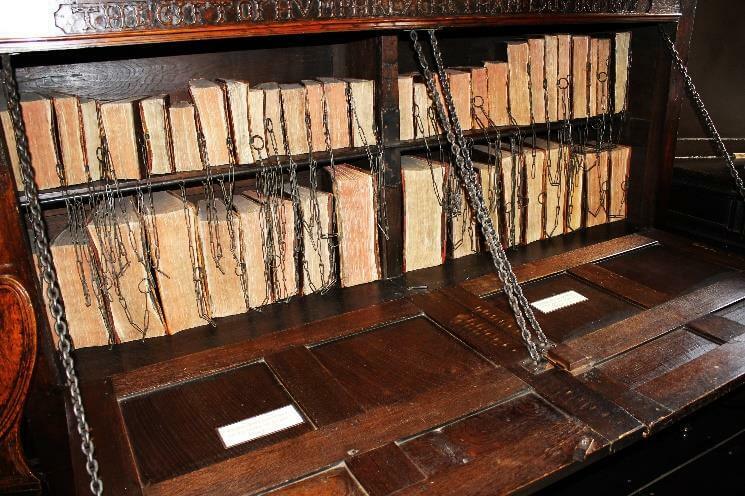 Chetham also made provision for a school for forty poor boys (now a specialist music school of world renown), and for five chained libraries to be placed in local churches. 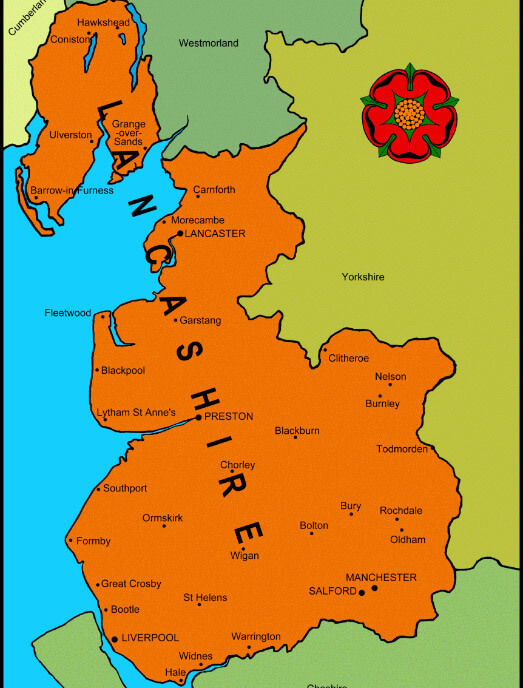 Two of these survive, in Gorton and Bolton. The building that houses the library is even older. It was built in 1421 to accommodate the priests of Manchester’s Collegiate Church and remains one of the most complete medieval complexes to survive in the north west of England. The beautiful old sandstone building, together with the magnificent library interior, create a unique atmosphere for readers and visitors alike. It is wonderful to sit in the reading room and imagine the people who have also sat there down the ages (including Karl Marx and Friedrich Engels). At the time of the library’s foundation there was no facility for independent study in the north of England. The twenty-four governors appointed by Humphrey Chetham set out to build up a major collection of books and manuscripts that would cover the whole range of available knowledge, and would rival the college libraries of Oxford and Cambridge. Since the creation of public libraries in the nineteenth century, Chetham’s has specialised in the history and topography of Lancashire and Greater Manchester. William Lawson, A New Orchard and Garden, 1638. 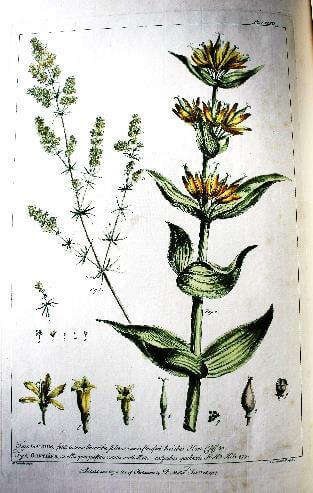 …or the Best Way for Planting, Grafting and to make any ground good for a rich orchard: particularly in the north…With The Country Housewifes Garden for Herbes of Common Use, their vertues, seasons, profits, ornaments, variety of knots, models for trees, and plots for the best ordering of grounds and walkes. … all being the experience of 48 yeares labour, and now the third time corrected and much enlarged … newly added the art of propagating plants, with the true ordering of all manner of fruits, in their gathering, carrying home and preservation. Lawson was a Yorkshireman, so well versed in the cultivation of species for the north; his work The Country Housewife’s Garden was the first addressed specifically to women, and so recognises their contribution to the drive to ‘grow-your-own’.Members Anna Harvey and Anne Hasted had a double interest in the visit. 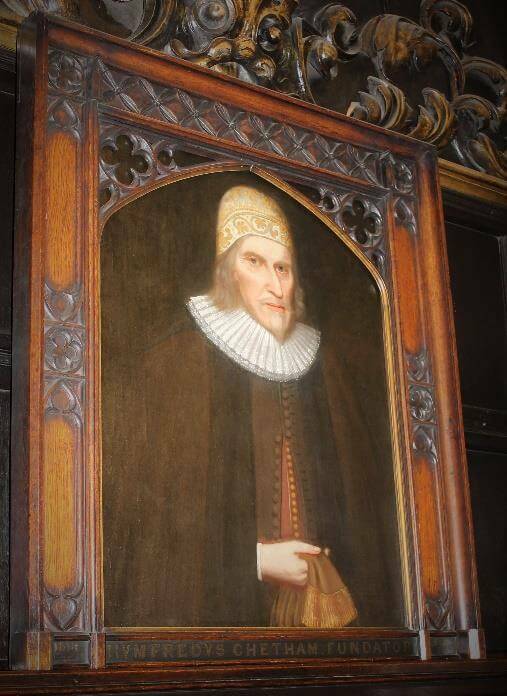 Humphrey Chetham purchased Turton Tower and installed in the church there one of his five ‘mobile’ chained libraries. At Turton it is planned to create a Tudor Garden, so Lawson’s advice, and drawings, will be very useful. Johannes Kip’s bird’s eye views in Britannia Illustrata1709 included the French-style garden at Haigh Hall, near Wigan, seat of the Bradshaigh family. The very geometrical layout features long, straight avenues of ‘feathered’ trees, repeated squares of grass plats, and many fountains set in circular basins. The style is very much that of the famous duo George London and Henry Wise, who created the genteel layout at Stonyhurst – and Hampton Court. The fountains must have looked impressive when working, but there is no sign of the water source which must have been substantial. A bound set of plans on vellum showed in great detail properties in the Withy Grove district of Manchester, and was dated circa 1750; in pictogram form were houses, some gardens and many orchards. This item has been requested so often that it has been put onto CD for better access. In 1779 a friend published for the owner A Catalogue of the Plants at the Garden of J B Blackburne, Orford, Lancashire. It is a delightful collection of descriptions and illustrations, and a valuable record of the plants available particularly from the east coast of north America which was starting to provide much interesting new material.